Haq's Musings: Pakistan Naval Exercise "Aman 2009"
After completion of the harbor phase, the sea phase of the Naval Exercises named “Aman 2009” hosted by Pakistan Navy started last Monday. The 10-day exercise, which began March 5, is designed to improve maritime security in the region, strengthen international partnerships and highlight the importance of maritime cooperation. As part of this exercise, ships will conduct search-and-rescue operations, surface exercises, submarine warfare, air-defense training, explosive ordinance disposal (EOD) exercises and participate in foreign officer exchanges. The exercise also includes replenishment at sea, formation display of helicopters and fly past by Pakistan Navy’s Fokker Atlantic, P3C Orion and Mirage aircraft. There is also an “anti submarine” exercise involving Sea King helicopters with Pakistan Navy commandos on board PNS Tipu Sultan. As many as 13 ships of nine countries including Pakistan are taking part in the four-day sea phase. They include United States, China, France, Britain, Bangladesh, Malaysia and Japan. The countries that are participating as observers are: Australia, Bahrain, Brazil, Egypt, Gambia, Germany, Indonesia, Jordan, Libya, Maldives, New Zealand, Oman, Qatar, Russia, Saudi Arabia, Singapore, South Korea, Spain, Sudan, Thailand, Vietnam, Azarbaijan, Kazakistan and Kenya. "This exercise provides U.S. and international forces the opportunity to work together and train across the spectrum of naval disciplines," said Capt. Rick Williams, U.S. 5th Fleet Maritime Operations Center director. "Aman 2009 will improve the interoperability and tactical proficiency between coalition nations and enhance our navies' effectiveness in supporting maritime security objectives." U.S. ships participating in the exercise include Boutwell, USS Theodore Roosevelt (CVN 71) and USS Lake Champlain (CG 57), all assigned to U.S. 5th Fleet. Pakistan is an integral member of the Combined Maritime Forces headquartered in Bahrain and has commanded Combined Task Force 150 twice, most recently November 2007-February 2008. Pakistan is also an important regional partner of the United States and plays an important role in helping provide security and stability to the region. Maritime Security Operations (MSO) enhance stability in the maritime environment, which promotes global prosperity. These operations complement the counterterrorism and security efforts of regional nations and seek to disrupt violent extremists' use of the maritime environment as a venue for attack or to transport personnel, weapons or illicit material. Along with the US, the Chinese Navy is also a big participant. A Chinese naval force, composed of the destroyer Guangzhou, a helicopter and 10 members of the marine corps is taking part in the exercises, according to Chinese spokesman Huang Xueping. Prior to Aman 2009, the world’s biggest Coalition exercise "Bright Star 2007" took place in the Mediterranean, where Navies of Egypt, Pakistan, Britain, Turkey, Greece, USA and Italy participated in the sea phase. The Indian Navy also conducts regular joint exercises with other nations and the most recent one was with Japan off Mumbai coast in August, 2008, just prior to the Mumbai attacks for which the terrorists allegedly entered the the metropolis by sea route. In comparison with the relatively small Pakistan Navy, the Indian Navy is the world’s fifth largest navy. It is proud of its "blue water" capability to operate on the high seas away from the Indian shores to project India's "combat power" in the Indian ocean to impress neighbors and to "safeguarding our maritime interests" , according to the Indian Navy's official website. It is a three-dimensional force consisting of sophisticated missile-equipped warships, aircraft carriers, minesweepers, advanced submarines and the latest aircraft in its arsenal. India's Naval forces are maintained and supported by modern dockyard facilities with state-of-the-art technology. The Indian Navy has two major Naval bases at Mumbai and Visakhapatnam on the two coasts of India. The Chinese PLA Navy, the other major power in Asia, has ambitious plans to become the world's largest force but it currently lacks any aircraft carriers. There are strong rumors that China is building its own aircraft carriers for addition to its navy in the near future. 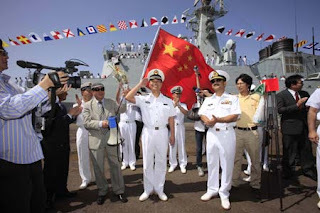 It has become clear that the Chinese Navy is beginning to challenge the presence of the US Navy in its coastal waters. Recently, there was an incident between the US and Chinese navy ships in South China Sea in which each nation protested the other side's behavior. The confrontation between a United States naval vessel and five Chinese ships is the “most serious” military dispute between the two countries since a midair collision in 2001 forced an American surveillance plane to land on Hainan island, the director of national intelligence, Dennis C. Blair, said Tuesday before the US Senate Armed Services Committee. China accuses the US of spying on the Chinese navy in South China sea, and wants it to stop. While Pakistan is working with China, France and the US to build up its Navy, Indian Navy continues to rely on Russian help. Last year, the BBC reported that there have been issues related to the acquisition of the aircraft carrier named Admiral Gorsckov by the Indian Navy. From a negotiated price of $700m, the Russians subsequently demanded $1.2bn with delivery delayed till 2013. Around the same time, the Indian Navy refused to accept an upgraded diesel-powered submarine after delays in the installation of a missile system from Russia. As the smallest of the three branches of Pakistan's armed forces, Pakistan Navy objectives were summarized well by a former PNS deputy chief Rear Admiral Afzal Tahir, who said in 2001 that "The Pakistan navy continues to strive hard to make up for the deficiencies and achieve a qualitative edge over a numerically superior enemy (India)." A quick comparison with Indian Navy, the world's fifth largest, shows that Pakistan Navy is quite capable of inflicting significant damage on the Indian Navy in case of hostilities in the Arabian Sea. The Indian Navy has 16 submarines. Pakistan Navy has ten, some are brand new. Indian Navy has 27 war ships, Pakistan Navy has ten. The aging Indian Aircraft Carrier Viraat (expected to be replaced by Russia's refurbished Admiral Gorshkov) can still be a menace, and it will have to be dealt with effectively, if it attempts to blockade Pakistan’s sea lanes or ports in the unlikely event of war that Pakistan and India came close to fighting in the aftermath of Mumbai attacks in late 2008. Conducting multinational naval exercises such as Aman 2009 is a desirable part of international military diplomacy enhancing Pakistan's standing in the world. Aman 2009 naval exercises also present an excellent opportunity for Pakistan Navy personnel to train with some of the top navy professionals in the world, and stay abreast of the latest developments necessary for the small Pakistani force to effectively perform its mission of maintaining peace and security in the Arabia sea. LOL PN should be compared to ICG not IN. PN is a joke and after the thrashing of 71 will not dare to come out and play. It seems you're stuck in the 1971 mindset, a big mistake. Big, outdated Indian Navy ships bought from the Russians are going to be sitting ducks for a smaller, more mobile and agile Pak Navy...remember the big hole in the side of USS Cole near Aden? That's going to be the future of Indian Navy ships. Pakistan Navy's maritime exercise `SEASPARK 2009' commenced on Monday. An ISPR (Navy) press release said on Monday that the exercises panning over six weeks, will be conducted in North Arabian Sea employing all operational units of Pakistan Navy including ships, submarines, aircraft, Special Services Group and Pak Marines. It said that the main objective of the exercise is to assess the operational readiness of Pakistan Navy and provide an opportunity to the officers and men to operate under multi-threat environment and exercise responses accordingly. The exercise has been divided into four main phases: Preparatory, Mobilization, War and Analysis. The exercise is presently in the Mobilization Phase which includes activation of Forward Operating Bases, Dispersal Sites and Command and Control Centers. Opening brief of the exercise was held this morning at PN Dockyard which was presided over by Chief of the Naval Staff, Admiral Noman Bashir. Participating units of the exercise, which also include supporting units from PAF, have been divided into Blue and Orange forces depicting friend and foe respectively. The exercise is conducted under the auspices of Pakistan Navy Ops Directorate headed by Rear Admiral Tanveer Faiz. Commander Pakistan Fleet Rear Admiral Asif Sandila commands the Blue Force whereas Rear Admiral Abbas Raza is incharge of Orange Force. During the inaugural session, the Force Commanders presented their Concept of Operations (ConOps). Karachi, Pakistan Navy's Annual Seaspark Exercise 2009 concluded Thursday in North Arabian Sea with Chief of Naval Staff Admiral Noman Bashir saying the major exercise helped to test war preparedness, refinement of operational plans and integration of newly acquired weapons, sensors, etc. ``After analyzing Exercise 2009 we will further improve ourcapabilities. Pakistan Navy has a capablity gap which need to befurther srengthened. However, there are constraints and we have tooperate in this environment,'' Admiral Noman Bashir told newsmen onboard PNS Nasr in North Arabian Sea.``Navy is balanced force, plays important role in peace and wartimes, is also an instrument of foreign policy. Navy is taking partin anti-terrorism and anti-piracy operations in its area ofoperations and an important player in the region. ``We are associated in anti-terrorism and anti-piracy operationswith International coalition forces in Gulf region as well as Gulfof Aden where Navy's ships are also deployed. Currently PakistanNavy is heading its anti-terrorism Task Force,'' he stated.He said Arabian Sea at present is the world's most important region due to its location in the Gulf (Strait of Hormuz where 66%of world's oil supply is produced), Gulf of Aden & Strait of Malacca and also ``very important'' for trade and energy requirements globally. ``We proposed to the government to set up a Joint Maritime Organization comprising Coast Guards, Maritime Security Force,Fisheries Department, Karachi Port Trust and other bodies dealing at harbour, sea, shores, ports, to deal with counter terrorism operations. Organizations's lead role has to be with Navy. I hope government will approve the proposal,'' Chief of Naval Staff said.Admiral Noman Bashir felt Gwadar, on Balochistan coast is a strategic deep seaport for commercial and defence purposes and need to be fully operationalized by its operator as it has great potential. Navy has a base at Gwadar, he added.Earlier Rear Admiral Tanveer Faiz,Deputy Chief of Naval Staff (Operations) said there is ``stablity'' in North Arabian Sea where Pakistan Navy operates to counter terrorism and piracy. ``We are on the alert and maintain strict watch in North Arabian Sea as searoute is lifeline of our economy since 97% of our two-way trade is by sea. ''Commodore Mohsin Riaz, Assistant Chief of Naval Staff said in16-day long Seaspark Exercise 2009 Exercise, Navy was able to check its operational preparedness, integration of newly acquired weapons,sensors, etc.Chief of Naval Staff also witnessed a spectacular display by naval ships, submarines, aircraft, helicopters. KARACHI: Pakistan Navy’s multinational exercise, Aman 2011, entered its sea phase on Friday when ships, helicopters, submarines and special forces sailed out to the Arabian Sea. According to a press statement, all maritime platforms participating in the exercise are working in real-threat environment. Tactical manoeuvres, replenishment at sea, transfer of men and material from one ship to another, surface firing on pre-determined targets, countering air-to-surface and surface-to-surface threats, insertion of commandos on ships through helicopters and submarine warfare exercises were conducted during the drill. Search and rescue exercises were also rehearsed. During the harbour phase earlier, participating countries discussed the planning and execution of exercises. Standard Operating Procedures were also discussed to be implemented during the sea phase. The sea phase will be followed by analysis. The first Oliver Hazard Perry (OHP) frigate set sail for Pakistan on Monday. The frigate was acquired by Pakistan Navy from the United States. The ship is formerly known as the USS McINERNEY (FFG-8) and was commissioned in the Pakistan Navy as the PNS ALAMGIR (FFG-260) on August, 31, 2010 during a huge ceremony at the Mayport, Naval Station. The ceremony was attended by Pakistan’s Ambassador to the United States Husain Haqqani. After commissioning, the PNS ALAMGIR underwent modernization and refurbishment and the BAE System Shipyard in Jacksonville Florida. 18 officers and 218 CPO/ Sailors underwent a series of training sessions to be able to operate the ship. The Ship Transfer and Assistance Team (STAT) contributed greatly in the training. The Pakistan Crew’s stay in the US, not only contributed to the better understanding on issues of mutual concern, but also strengthened the relations between the two nations. Captain Naveed Ashraf T.Bt TI(M) was announced as the first Commanding Officer of the PNS ALAMGIR. The ship set sail for Pakistan on Monday, after the completion of the final trials and cre workup. The ship is scheduled to stop at Bermuda (UK), Azores (Portugal), Cadiz (Spain), Golcuk (Turkey), Jeddah (Saudi Arabia) and Salalah (Oman) and would eventually reach Pakistan on 13 May 2011. The PNS ALAMGIR will be a part of the 18th Frigate Squadron of the Pakistan Navy Fleet. Pakistan has become one of the important members of Global War on Terror (GWOT). Due to Pakistani government’s decision to fight terrorism, the Pakistan Navy joined the maritime coalition against terrorism which is led by the US. At the moment the Navy participates in the Coalition Maritime Campaign Plan (CMCP) which is one of the maritime components of the Global War on Terrorism. The CMCP encompasses operations in support of Operation Enduring Freedom (OEF). The coalition forces work under the command of United States Naval Forces Central Command (US NAVCENT). The responsibility areas include the Persian Gulf, Gulf of Oman, Arabian Sea and Red Sea. Despite the strong resource constraints, the Pakistan Navy has always been a number one participant in the CMCP. The Pakistan Navy was the first regional navy to form a part of the CMCP and has greatly contributed its assents to ensuring stability and peace in the region. The Pakistan Navy has so far contributed one frigate to Task Force 150 (TF-150) and a Type-21 frigate to Task Force 151 (TF-151). The Pakistan Navy has commanded TF-150 f our times and is currently in charge of the TF-151 off the coast of Somalia, where they are countering piracy. Pakistan is also the first non-NATO country to command a Task Force. The Oliver Hazard Perry Class Frigates are being used by a lot of navies and their main strength is conducting Maritime Security Operations which have become the main concern of the nations. The PNS ALAMGIR is scheduled to augment Maritime Security Operations in the Arabian Sea. Another of its goals is to support the Pakistan Navy Surface Fleet. The PNS ALAMGIR has been named after Emperor Aurangzeb Alamgir who was the sixth Muslim Ruler of Great Mughal Empire and is known to be one of the most fierce and experienced warriors, who protected his territories and was the Empire’s leader for nearly 50 years. Thanks to him the influence of the Mughal Empire was spread to the entire Indian Sub-continent. Pakistan’s arsenal of a variety of advance ballistic and cruise missiles merits attention. Reports suggest that Pakistan is developing MIRV capability for the Shaheen-II ballistic missiles and Shaheen-III missile is under development. Although the current capability of Pakistani missiles is built around radar seekers and the GPS updates provide enormously accurate CEP, the integration of ‘re-entry vehicle’ would make these extremely potent and defeat the anti-ballistic missile defence systems. In the Indian context, there is as yet no sea based anti ballistic missile system and this gap in their defence can make the Indian aircraft carriers highly vulnerable. The Indian navy may have integrated the anti ship missile threat from surface , sub surface and air platforms of the Pakistan Navy, a salvo of DF-21 or Shaheen-II / III ballistic missiles poses an ‘existential threat’ and could be worth the attention it merits. In essence, the ASBM threat necessitates an equal priority as acquisition of aircraft carriers. The State Department has made a determination approving a possible Foreign Military Sale to Pakistan for GRC43M Cutters and associated equipment parts training and logistical support for an estimated cost of 350 million.